I have a slight issue with having an excessive fabric stash. Most of it is leftover from other projects I’ve completed, but I also struggle with passing up a cute clearance fabric, and then it just sits until I figure out something to use it for. I tried out these fabric pumpkins by sewing and using a no-sew technique, and both worked great. If you’re looking for tips on how to make these without a sewing machine, scroll down to the second half of this post. In the tutorial pictures, you’ll see I used pinking shears to cut the fabric. For this pumpkin, I decided to leave the edges exposed (to give the seams some definition, and a rustic look). In my no-sew pumpkin, I created the pumpkin with hidden seams, so just choose the look you like better. I started by cutting strips of fabric, about 2 inches wide by 7 inches long. I actually started varying the widths of fabric and I like the look of that, but if you like a symmetrical pumpkin, you’ll want to cut strips in equal widths. Stitch 6-8 of the strips together. Then, sew the two ends strips together. To achieve the frayed look, stitch with wrong sides together. For normal seams, stitch with right sides together. 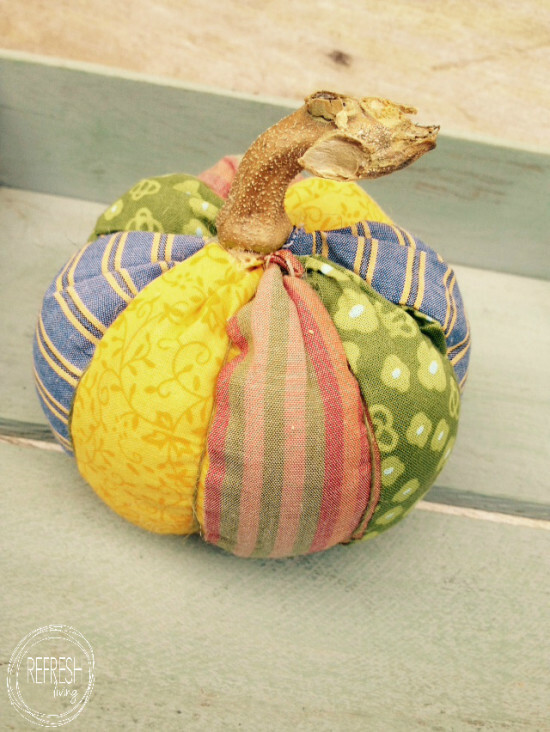 Turn the pumpkin (right now it will just look like a fabric tube) inside out. Double thread a needle and tie a knot at the end. Sew a gathering stitch (wide stitches spaced apart) around the bottom and pull thread to tighten. Tie a knot to secure in place. Turn fabric right-side out and add stuffing. Once it is the size you’d like, sew a gathering stitch on the top, and secure with a knot once the thread is pulled tight. Cut off the excess fabric and then you are reading to add your stem! I used stems from the butternut squash that I had just picked from my garden, but you could find sticks, or maybe pop the stems off of a few small pumpkins. A dab of hot glue holds them in place. I also experimented with a no-sew version and used Stitch Witchery for the first time. Basically, all of the steps are the same, except instead of sewing, you add a strip of the Stitch Witchery between the two pieces of fabric and follow the directions on the package to iron it in place. 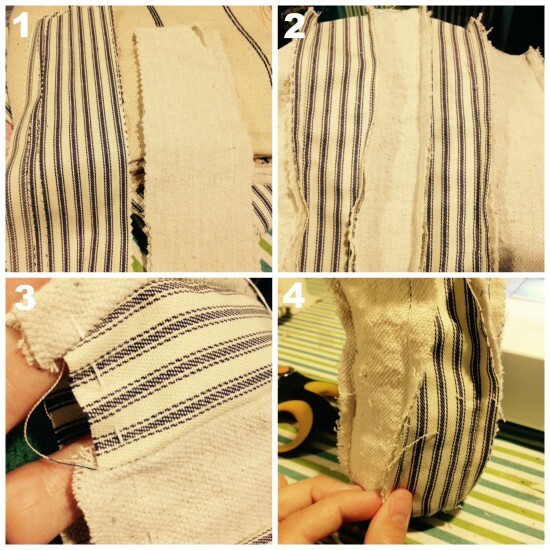 I wish I had known about this stuff before, when I didn’t have a sewing machine! 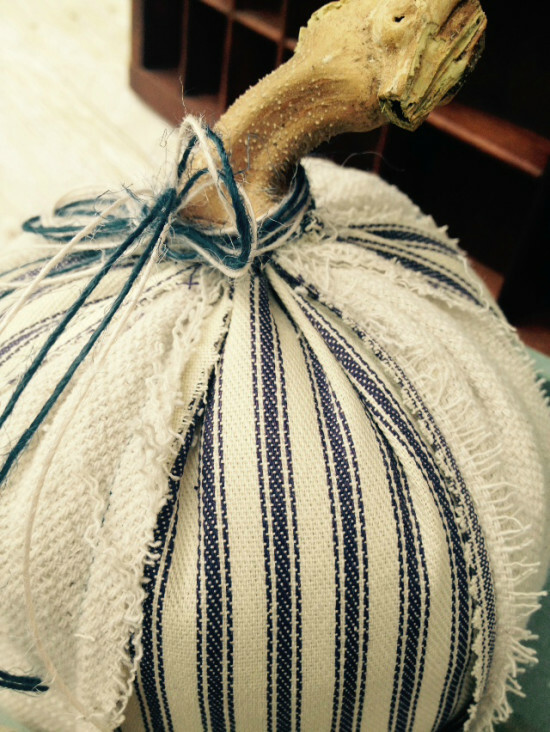 In order to create grooves running down the sides of the pumpkin, I just used some jute cord and wrapped it around the pumpkin in line with the seams. 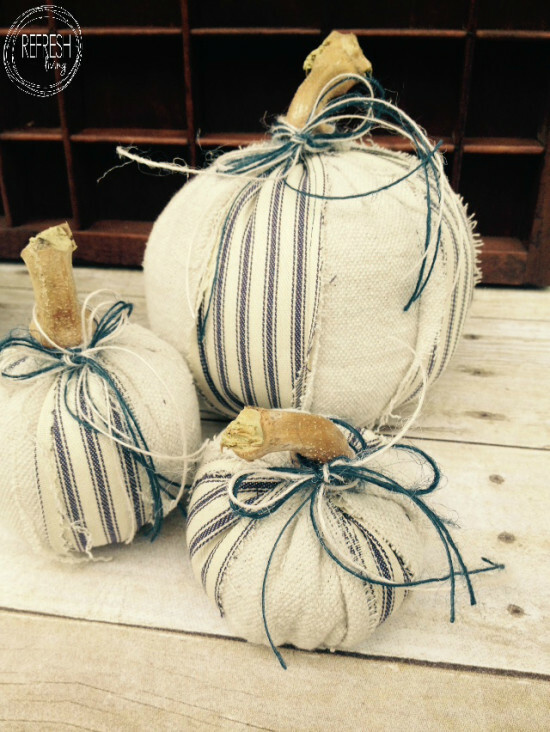 You could use thread, ribbon, or just plain old string for this, but it just gives it a more pumpkin-y look. These are super cute. Such a great idea for Fall decor! Super cute! 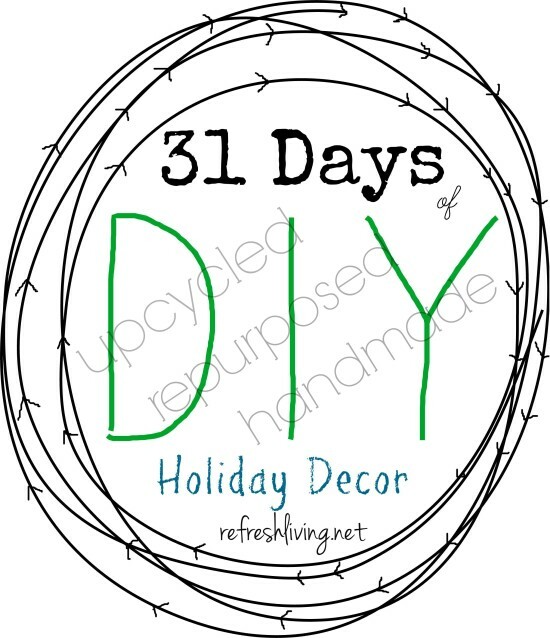 Anyone who sews or does fabric crafts could use their left-overs for these. If you have any wooden dowels left-over from other projects they might work as the stems, too. Great ideas! 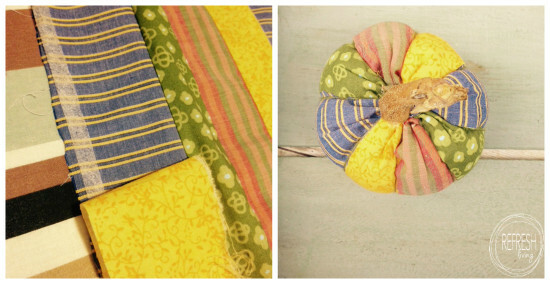 It was so fun to dig through my fabric scrap drawer to find different designs to use. These are so stinkin’ cute! Thanks for sharing. They’re seriously adorable. I’m off to find some leftover fabric! Thanks! Have fun digging through your old scraps! So crafty! I love this. Every time I see one of these in the store I want to buy one, but the PRICE! So glad to see that they are not as hard to make as they look. Thanks for sharing this wonderful post! Thanks, Christine! I really like the colorful one, too. I think I need to make some more random ones! 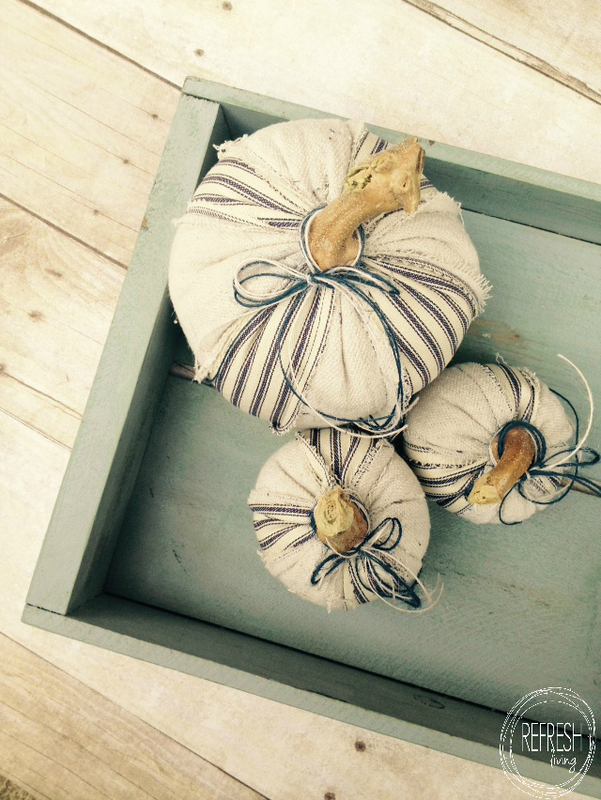 Hi, Jenny ~ I chose these adorable pumpkins as my feature at this week’s Merry Monday Link Party! Thanks so much for sharing them with us. We’d love to have you join us again this week! Awesome Project -These pumpkins are the cutest I’ve seen all season! That’s so nice of you to say, Carole! Thanks so much.